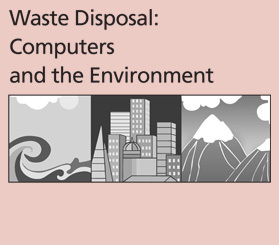 Waste Disposal: Computers and the Environment is a SEPUP module designed for use in grades 8–12. The module contains a series of 8 activities that provide approximately 3 weeks of instruction. This module focuses on toxic waste produced during the manufacture and disposal of technology such as computers. Students etch simulated circuit boards. They then conduct several activities to investigate dilution, precipitation, and metal replacement as options for handling the resulting toxic waste. They consider a variety of options for handling obsolete computers and learn about integrated waste management. Students then select a computer company from which to purchase school computers. Students are assessed on their ability to use evidence and identify trade-offs when making a decision.